There are several open source (aka free) tools that you can use to the security of your applications and servers like a hacker. One of the best is Kali Linux, a free tool that s almost every layer of you environment (Application, Network, Host, Foundation). Kali Linux was a creation of Offensive Security in an effort to achieve effective defensive security through an offensive mindset. Kali is supported not only by Offensive Security, but also a very impressive community of people who contribute content and software to the project. Kali is preinstalled with over 600 penetration ing scripts and programs (http://tools.kali.org/tools-listing). Formerly known as Backtrack, it’s been used by security professionals and hackers alike for years. This is one of the best tools that you can use to your security. Kali has just recently released version 2.0 of its open source penetration ing kit. It can be downloaded here. Run a python script called the harvester to query google, Bing, Linkedin, and PGP to find information related to your domain. It will include email addresses, IP addresses, and server configurations. OS fingerprinting will give you the versions of operating systems you may be running, which will allow you to look up any outstanding vulnerabilities. Run fragroute, which has a simple rule set language to delay, duplicate fragment, and analyze any intrusion detection that you might have in place. Finally, run NMAP, which will simply scan your IP address to find what TCP/UDP ports are open. You want to make sure that the only ports open are what you need to conduct business—nothing more and nothing less. Step 2: Nessus is a tool used by auditors and analysts to assess vulnerabilities in systems, networks, and applications. While this doesn’t replace the auditors who certify you for compliance, it does make you more secure by giving you a better understanding of the risks within your environment. It has configuration and vulnerabilities scanning capabilities, as well as malware detection and sensitive data searches. You can also utilize particular cloud services that will conduct the same scans and auditing in a way that is built for the cloud. Step 3: WPScan is a great tool if you are utilizing wordpress in your infrastructure. WPScan looks for vulnerabilities that might have been installed in your environment through vulnerable plugins and themes. The capabilities of this tool include brute forcing your passwords, finding vulnerable themes/plugins, and enumerating user lists to focus a password dictionary brute force. This is a very efficient tool and is maintained by the community and the WPScan team. Step 4: The automater is a script that will scan various blacklists to verify if your IP addresses have ever been involved in any botnet activity—if the previous or current users of that IP address were compromised and used to attack others, they would appear on one of those lists. This will ensure your public IP address won’t be blocked when you launch your live site. The automater checks IPvoid.com, Robtex.com, Fortiguard.com, unshorten.me, Urlvoid.com, Labs.alienvault.com, ThreatExpert, VxVault, and VirusTotal. These are just a few of the tools that are offered in Kali Linux, but they will get you started down the right path, by exploring the distribution of Kali and ing your environment to see how secure you really are. If you missed the last article in our four-part blog series with our strategic partner, Alert Logic, check out the guide to help digital businesses prepare for—and respond to—cyber incidents here. Security should be baked into the DevOps process, from tools to skills to collaboration. DevOps and security are not mutually exclusive. The problem with digital innovation is that considerations for compliance come later, after the product or service is on the market. From public cloud infrastructure to Internet of Things to mobile apps and even to DevOps, tough requirements like security aren’t built into innovators’ plans. Entrepreneurs are thinking primarily about shiny, new, fast and disruptive. Yet for the CIO and other chief executives accountable to customers, laws and financial markets, managing risk around sensitive data is top priority. DevOps processes are at the heart of business innovation: think Netflix, Facebook, Etsy and Nordstrom, all leaders in their sectors. Yet many of the popular DevOps tools and methodologies, whether commercial or open source, haven’t been optimized for the needs of enterprise security. An application running in a container, for instance, will still require attention around configuration to ensure application security. As well, many security professionals haven’t yet made the leap to understanding the changing best practices for security in this new world of cloud/agile/mobile IT. Some security experts have imposed barriers to DevOps, by resisting the switch to faster, more iterative development along with the public cloud. Use the best of DevOps for security: DevOps, with its focus on automation and continuous integration, provides a more holistic framework for security management. Start by considering security through every step of the development and production cycle. Security professionals can help developers root out design problems in the beginning – such as ensuring all data transport is encrypted. Integrate automated security checks into development, ing and deployment phases, and educate all team members about the importance of incorporating security thinking in their specific job roles. Security should no longer be the last process before committing the code to production. Investigate new DevOps and Cloud security tools: Fortunately, the security technology industry is ramping up quickly to the needs of DevOps security. Static Application Security (SAS) tools for security when code is being written while Dynamic Application Security (DAS) tools for interface risks. A few of the reputable systems include Checkmarx, Veracode and Parasoft. The third area of security automation tools covers penetration vulnerability ing, such as Nessus, developed by Tenable. Other contenders in this area include Qualys and OpenVAS. These tools can integrate smoothly into the software development lifecycle, such as by plugging into Jenkins. By adding automation, security is not only built-in, but doesn’t slow down the DevOps process. With the advent of DevOps, there’s an opportunity at last for security to become an integral and seamless aspect of innovation. We think it’s not only possible but critical to give security the attention it demands in the world of fast IT. This article was first published on DevOps.com on 12/3/15. Last week, we kicked off a four-part blog series with our strategic partner, Alert Logic, that has a focus on the importance of cloud security for Digital Businesses. This week, Alert Logic has contributed the following blog post as a guide to help digital businesses prepare for—and respond to—cyber incidents. The plan hasn’t been practiced by the incident response team. Unfortunately, most organizations view cyber incident response as a technical issue—they assume that if a cyber incident response plan is in place and has been reviewed by the “techies,” then the plan is complete. In reality, all these organizations have is a theoretical cyber incident response plan, one with no ing or validation. Cyber incident response plans are much more than a technical issue. In the end, they are about people, process, communication, and even brand protection. The key to ensuring your cyber incident response plan works is to practice your plan. You must dedicate time and resources to properly the plan. Cyber incident response is a “use or lose” skill that requires practice. It’s similar to an athlete mastering a specific skill; the athlete must complete numerous repetitions to develop muscle memory to enhance performance. In the same way, the practice (repetitions) of ing your cyber incident response plan will enhance our team’s performance during a real incident. The incident response manager reads through the plan, using the details of a recent data breach to follow the plan. The manager also identifies how the incident was discovered as well as notification processes. The team follows the triage, containment, eradication, and forensics stages of the plan, identifying any gaps. The incident response manager walks through the communications process along the way, including recovery and steady-state operations. The team documents possible modifications, follow-up questions, and clarifications that should be added to the plan. The next step to a self-assessment is the walk-through with the entire incident response team. This requires an organized meeting in a conference room and can take between 2-4 hours, in which a scenario (recent breach) is used to walk through the incident response document. These working sessions are ideal to fill in the gaps and clarify expectations for things like detection, analysis, required tools, and resources. Organizations with successful incident response plans will also include their executive teams during this type of . The executive team participation highlights priorities from a business and resource perspective and is less focused on the technical aspects of the incident. The most important step in evaluating your incident response plan is to conduct a live exercise. A live exercise is a customized training event for the purpose of sharpening your incident response teams’ skills in a safe, non-production environment. It isn’t a penetration ; it’s an incident response exercise designed to your team’s ability to adapt and execute the plan during a live cyber attack. It’s essentially the equivalent to a pre-season game—the team participates, but it doesn’t count in the win/loss column. The value of a live exercise is the plan evaluation and team experience. The lessons learned usually prove to be the most valuable to the maturation of your cyber incident response plan. Ultimately, preparedness is not just about having an incident response plan; it’s about knowing the plan, practicing the plan, and understanding it’s a work in progress. The development of an excellent incident response plan includes involvement and validation from the incident response team as well as a commitment to a repetitive cycle of practice and refinement. Learn more about 2W Managed Cloud Security and how our partnership with Alert Logic can ensure your environment’s security. Implementing security in a cloud environment may seem like a difficult task and slows down, or even prevents, some organizations from migrating to the cloud. Some cloud security models have similarities to traditional data center or on-premises security; however, there are opportunities to implement new security measures as well as tweak your existing security plan. Here are five tips for getting started with cloud security. Knowing and understanding account usage and the types of coding languages, inputs, outputs, and resource requests is essential. These strategies are usually more people and process driven, but are important components to the care of feeding of the technology solution. Organizations should take inventory of all the data they are maintaining and understand what type of data it is, where it is being stored, what accounts have access to this data, and how is it being secured. Attackers continue to use brute force attacks against accounts to crack passwords and gain authenticated privileges in your environment. Accounts should follow the least privilege concept and account activity should be logged. A robust logging and log review system should be a standard implementation for all systems, accounts, and configuration modifications to ensure accountability of legitimate activity. Generally, cloud providers will have security implemented throughout their core infrastructure, which is primarily designed to safeguard their systems and the basic foundational services for each of their customers. Cloud providers will maintain and secure their infrastructure; however, they won’t necessarily provide customers reports or notifications from this layer unless it impacts a significant amount of customers. Therefore, it is highly recommended that you implement a customized security plan within your own cloud environment. At the moment a cloud provider drops a network packet onto your systems, you should employ security monitoring and network threat detection. 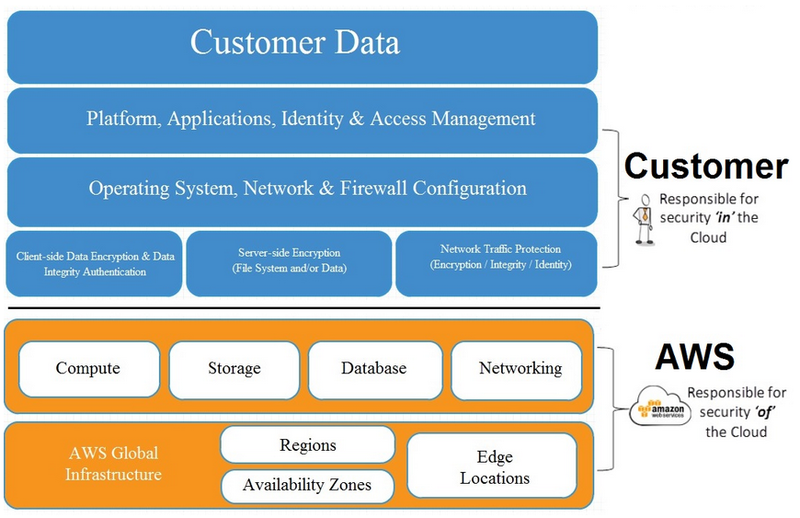 The customer responsibility for security increases when moving from the network level to the host level and further to the application level. Once you have access to your operating system, you are giving root/administrator access and therefore, that system is yours to secure and manage. At this point, the customer is responsible for the security of the applications and the application code that is used on the host systems. Cloud customers need to pay particular attention to the application code that is used in their environment since web application attacks are the most prevalent type of attacks used by adversaries. Organizations should also stay informed about the la threats and vulnerabilities to their cloud systems. Adversaries, hacking groups and security researchers are constantly working to discover new vulnerabilities within systems and keeping up with these threats is imperative. Organizations that have dedicated resources to monitoring and responding to the la threat activities are able to anticipate cyber activity and minimize the impact of an attack. Implementing effective security within a cloud environment may seem to be a challenging task; however, a strategic plan and the proper integration of people, process, and technology enable organizations to overcome this challenge. Security is a stifling fear for organizations considering public clouds, one frequently stoked by IT vendors with vested interests in selling enterprise IT hardware and software using security as a catalyst for overall FUD about cloud services. The fears and misconceptions about cloud security are rooted in unfamiliarity and conjecture. A survey of IT pros with actual cloud experience found the level of security incidents relative to on-premise results quite similar. When asked to compare public cloud versus on-premise security, the difference between those saying the risks are significantly lower versus higher is a mere one percent. Cloud infrastructure is probably more secure than typical enterprise data centers, but cloud users can easily create application vulnerabilities if they don’t understand the available security services and adapt existing processes to the cloud environment. 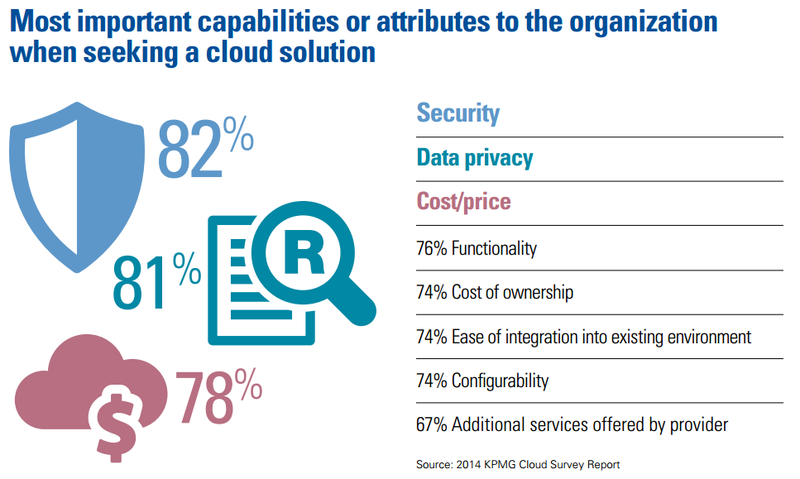 Whatever the cause, the data shows that cloud security remains an issue with IT executives. 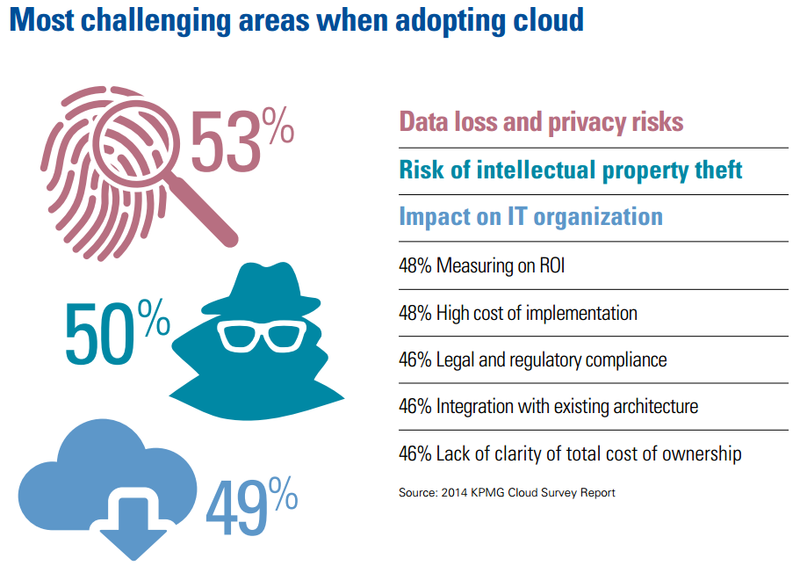 For example, a survey of security professionals found that almost half are very concerned about public cloud security, while a 2014 KPMG survey of global business executives found that security and data privacy are the most important capabilities when evaluating a cloud service and that the most significant cloud implementation challenges center on the risks of data loss, privacy intrusions and intellectual property theft. Unfortunately, such surveys are fraught with problems since they ask for subjective, comparative evaluation of two very different security models, one (on-premise) that IT pros have years of experience implementing, managing and refining, and the other (public cloud) that is relatively new to enterprise IT, particularly as a production platform, and thus often not well implemented. The ‘problem’ with public cloud security isn’t that it’s worse, no, it’s arguably better. Rather, the problem is that cloud security is different. Public cloud services necessarily use an unfamiliar and more granular security design that accommodates multi-tenant services with many users, from various organizations, mixing and matching services tailored to each one’s specific needs. AWS designs cloud security using a shared security model that bisects security responsibilities, processes and technical implementation between the service provider, i.e. AWS, and customer, namely enterprise IT. In the cloud, IT relinquishes control over low-level infrastructure like data center networks, compute, storage and database implementation and infrastructure management to the cloud provider. The customer, i.e. enterprise IT, has control over abstracted services provided by AWS along with the operating systems, virtual networks, storage containers (object buckets, block stores), applications, data and transactions built upon those services, along with the user and administrator access to those services. Network security: virtual firewalls, network link encryption and VPNs used to build a virtual private cloud (VPC). Inventory and configuration: comprehensive view of AWS resources under use, a catalog of standard configuration templates and machine images (AMIs) and tools for workload deployment and decommissioning. Data encryption: security for stored objects and databases and associated encryption key management. Access control: user identity management (IAM), groups and policies for service access and authentication options including multifactor using one-time passwords. Monitoring and logging: tools like CloudWatch and CloudTrail for tracking service access and use, with ability to aggregate data from all available services into a single pool that feeds comprehensive usage reports, facilitates post-incident forensic analysis and provides real-time application performance alerts (SNS). Organizations should apply existing IT security policies in each area by focusing first on the objectives, the policy goals and requirements, then mapping these to the available AWS services to create control points in the cloud. For example, comprehensive records of user access and service usage are critical to ensuring policy adherence, identifying security gaps and performing post hoc incident analysis. CloudTrail fills this need acting as something of a stenographer recording all AWS API calls, for every major service, whether accessed programmatically or via the CLI, along with use of the management console. CloudTrail records are written in JSON format to facilitate extraction, filtering and post-processing, including third party log analysis tools like Alert Logic, Loggly and Splunk. CloudTrail so thoroughly monitors AWS usage that it not only logs changes to other services, but to itself. It records access to logs themselves and can trigger alerts when logs are created or don’t follow established configuration guidelines. For security pros, CloudTrail data is invaluable when used to build reports about abnormal user or application behavior and to detail activity around the time of a particular suspicious event. The key to AWS security is understanding the division of responsibilities, the cloud control points and available tools. Mastering these can allow cloud-savvy organizations to build security processes that exceed those in many on-site data centers.